The skin is the ultimate barrier to the external environment, with a coverage area of the entire body. To perform its specialized functions, the skin is composed of multiple layers: the epidermis (outermost layer) and dermis (innermost layer). Below the dermis is the hypodermis, which is a layer of subcutaneous tissue, composed of connective tissue and fat that helps attach the skin to the bone and muscle below. The epidermis is a stratified squamous epithelial layer that mostly is made up of keratinocytes, which largely serve a barrier function. As keratinocytes differentiate and move from the inner to the outer layer of the epidermis, they become post-mitotic and cease to divide. Eventually, they lose their nucleus to become corneocytes, and are ultimately sloughed off the skin surface. The dermis is largely composed of connective tissue, but also contains hair follicles, sweat glands, and blood vessels. 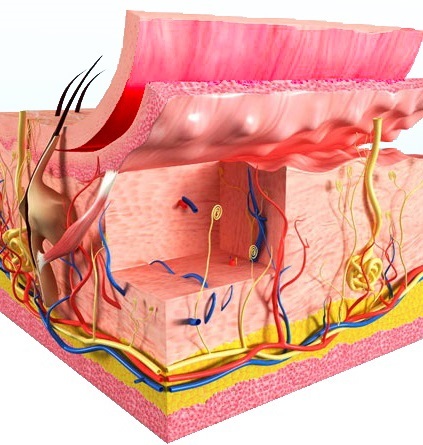 Dermal fibroblasts are largely found in the dermis, where they produce the connective tissue and extracellular matrix components that support the epidermis and contribute to wound healing. DNA damage occurs by various mechanisms, including exposure to UV light. DNA damage can stall DNA replication; therefore, activation of DNA damage repair pathways is a crucial step to resuming normal cellular activities. Aresenite exists as one of the oxidation states of arsenic, which is better known because of its negative effects on human health. On a molecular level, arsenite blocks DNA damage repair by competing with zinc for binding to the zinc finger DNA repair protein, PARP-1, whose activity it blocks. Zinc is an essential factor for PARP-1 function, and low zinc levels cause reduced function of PARP-1. In turn, zinc supplementation causes increased PARP-1 activity. With this in mind, Ding et al. investigated the effect of arsenite on the function of the DNA damage repair protein XPA using Lifeline® normal human epidermal keratinocytes cultured in DermaLife K® medium. The research group first compared the interaction of zinc and arsenite with both PARP-1 and XPA. They found that arsenite and zinc competed for binding to both proteins in a concentration-dependent manner. Next, the group found that arsenite displacement of zinc on both PARP-1 and XPA resulted in decreased binding to DNA, which is the first critical step of DNA repair. To determine the effects of arsenite on DNA repair, the researchers treated cells with UV radiation and/or arsenite and measured the retention of DNA damage lesions over time. Interestingly, they found that cells treated with a combination treatment of UV radiation and arsenite had more unrepaired DNA lesions than cells treated with UV radiation alone. Importantly, supplementation with zinc reversed these effects, demonstrating that increased zinc levels might combat the negative effects of arsenite on DNA repair. Together, the researchers demonstrated that arsenite binds and inhibits XPA activity. Additionally, although arsenite and zinc compete for the same binding site on PARP-1 and XPA, zinc supplementation could displace arsenite (and vice versa) to reduce the detrimental effects of arsenite on inhibition of DNA repair. The relationship between the cytoskeleton and mitochondria has been established for many years. However, there has been little evidence to demonstrate a causative relationship between the two, whereby cytoskeletal integrity directly impacts mitochondrial function. In a 2016 study, the Eckmann lab at the University of Pennsylvania investigated how inhibition of cytoskeletal dynamics directly affected mitochondrial function using Lifeline® adult dermal fibroblasts grown in FibroLife® medium. They first established a system by which mitochondrial membrane potential (a measure of mitochondrial function) could be measured using fluorescent dyes that accumulate in the mitochondria. They then treated fibroblasts with cytoskeletal toxins, including nocodazole, cytochalasin D, or a combination of the two. However, they found that these toxins had no effect on mitochondrial membrane potential. Next, the researchers examined whether cytoskeletal toxins affected mitochondrial morphology, and found that mitochondrial length was reduced in cells treated with 5 μM cytochalasin D or combination treatment with 10 μM nocodazole and 1 μM cytochalasin D.
Mitochondria produce energy in the form of ATP and require oxygen in the final step of ATP generation. Therefore, the researchers evaluated whether cytoskeletal disruption affected the basal oxygen consumption rate (OCR) of cells. They found that the OCR was decreased in cells treated with nocodazole at either 10 μM or 50 μM, and in cells treated with a combination of 50 μM nocodazole and 5 μM cytochalasin D. Lastly, the researchers tested mitochondrial OCR following an additional stress, treatment with A23 (a calcium ionophore). They found that pretreatment with A23 sensitized mitochondria to the cytoskeletal toxins, and all combination treatments tested reduced OCR following A23 pretreatment. However, treatment groups that included high doses of nocodazole (50 μM), exhibited increased numbers of dead cells, suggested these treatments also affect cell viability. Together, the results of this study demonstrate that cytoskeletal dynamics are directly related to certain mitochondrial functions, particularly respiration. Lifeline® skin cells can be used in multiple ways to study wound healing, epithelial biology, or toxicology. Tell us how you are using our cells and your work could be featured here on the blog! While you are waiting for publication, check out the blog here every other week to learn how our other cell systems are being used. © Copyright 2016-2019 Lifeline Cell Technology, an International Stem Cell Company. All Rights Reserved.